It is here! The moment you have been waiting for - our Christmas in July blog hop for Send A Smile 4 Kids. First of all thank you for coming by and participating. I hope you will take a moment to look around and perhaps follow my blog. I would love to have you as a regular visitor. Shall we talk about rules? And how to win some of the awesome prizes being offered at EACH stop? I wish you the best of luck! I started with SAS4Kids a few months ago and I have really enjoyed being a volunteer. I collect (and make) cards for "my" hospital in Tennessee to use. They give cards to the children to use to send to their loved ones or staff. The staff can also use the cards to give to the children. This is SAS4Kids' 175th challenge! There are 17 stops in the blog hop each sponsored by volunteers and members of SAS4Kids. This hop begins on July 21st and runs through August 3rd at noon. Make sure you comment on this blog to possibly win a package of Doodles Paper Playground - Fairy Dust Sparkle Blends. 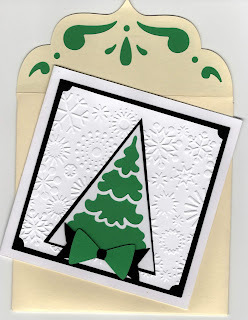 Then hop to the other blogs and comment to win gift certificates, more paper, rubber stamps, digital images and more! I spent a few days playing with some of my Christmas goodies and making cards. I went over to CARDZ TV and looked at some of the sketches for ideas use in planning my cards. I chose a couple of favorites and from there it was off to the Cricut. What would I do without my Cricut?! I cut the backgrounds and assembled the cards - six cards in around an hour or two. Then I used Paper Wishes dazzles and some Christmas stickers I had in my stash to finish them off. I listed the packs of paper underneath each card set. For my next card set, I used some plain cardstock I had, a Cuttlebug embossing die, and a wonderful cutting template for the Cricut by Dreaming Tree. Each card in this set has a matching envelope. They were very easy to assemble and fun to do. Curious as to what great goodies you can get? The list is huge and you get a chance to win at every stop - sometimes even more than one prize will be given at a stop!! It truly is Christmas in July! Thanks for coming by - your NEXT STOP is Jill Blasche! If you would like to make sure you get all of your opportunities to win, head back to the very beginning and start at SAS4Kids. Good luck on winning! 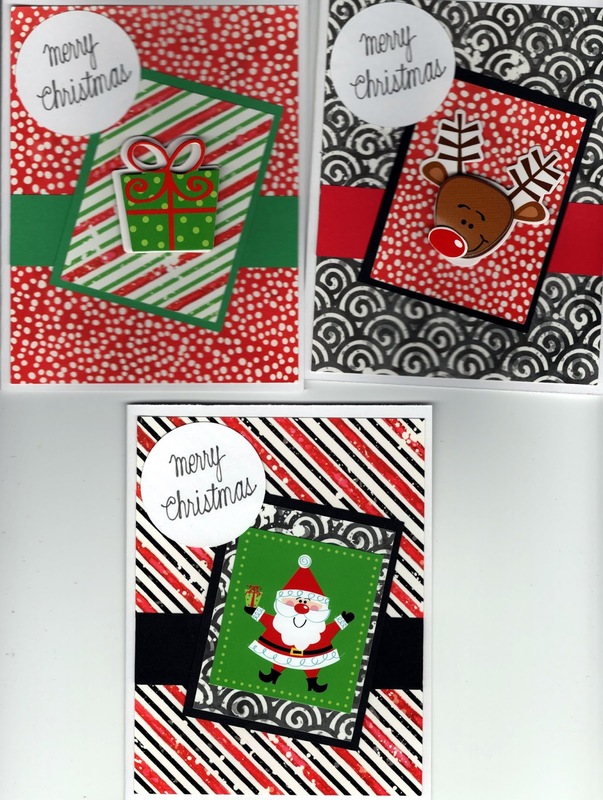 Perhaps with all the inspiration you are getting on this blog journey, you might like to join us at SAS4Kids and send some handmade cards to give to the children. 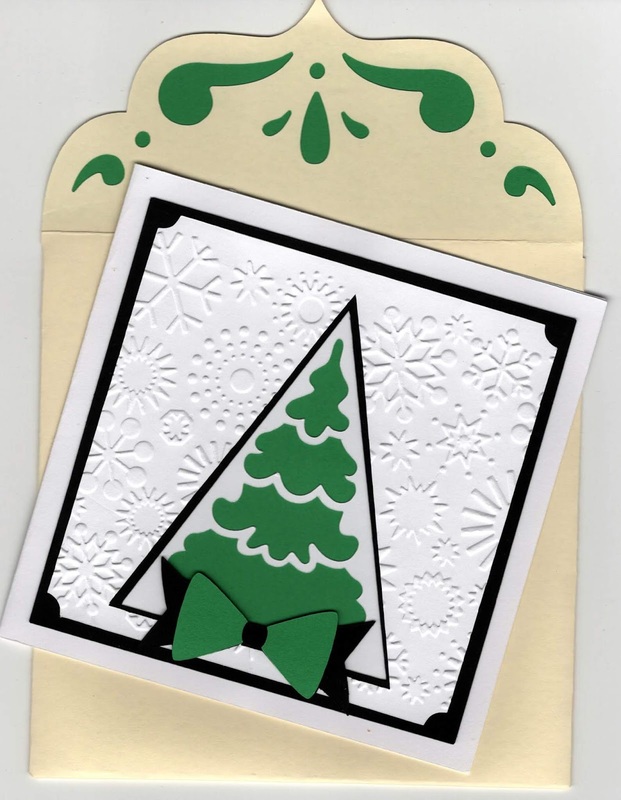 You can go over to the SAS4Kids blog and find the volunteer closest to you and send them some cards. Our kids love it! Such bright and colorful cards! Love them. Awesome array of cards, Cathy! I'm always amazed at how each looks so different, just by switching things up, but using the same layout. You've done an outstanding job for this blog hop and are going to brighten a number of children's days! Beautiful cards!! Thanks for all you do for kids! Vintage is a favorite of mine. You can't go wrong with Cardz TV sketches. Thank you for being there for the children and all of us who like to make cards. Cathy, this is the first time I've visited your blog. I love your zentangle header. My favorite card is the angel silhouette on the textured background. Ditto - Jean said what I was going to say about your header. Love that zentangle work. And your cards. The vintage look is my fav. Nice job! Awesome set of cards for the hop! They are sure to bring a smile! A great job on the sketches - lovely cards - TFS and for this hop! Such a smile will come to a child! You have really been busy. They are all great cards. I think my favorite are the vintage one. I definitely have to look into that Cricut cartridge. I have not seen it, and I love the simple cuts with your backgrounds. WOW! What an awesome variety of cards! The fun embossed backgrounds with contrasting pops of colors are so much fun!! Wow! Such a a wonderful group of cards. I love all the backgrounds you used. These are all really great cards. My favorite ones are the last three. Love the die cuts. Such an amazing b7nch of cards. So different. Great. I agree with "Just Jill" on the zentangles and the vintage look! I LOVE your cards! I'm going to ask Santa for a Cuttlebug for Christmas! Aren't Dreaming Tree SVG's wonderful! Thanks for sharing your talent!!! What a great collection of cards! Thanks for all you do for SAS4Kids. Your cards are lovely! What an awesome idea for the kids! Love your variety of cards. SAS4K great organization. Wonderful collection of cards! Beautiful designs and terrific combinations of patterned paper. Love the holiday cards and what a good idea to start now. Your cards are awesome! Great cards, you will make lots of children very happy. I can see why you love that Cricket. Very creative and fun cards. How talented you are. These are fun cards and I am sure your students enjoy your creations too. Wow--you have been busy. I like the designs and papers. Wow! So many sets - you have been busy. I like the vintage feel of the first, and those die cuts are beautiful! Your post is a great inspiration to me to get out the die cuts. I've been terrible at thinking I always have to color an image, but seeing your set of die cut cards makes me want to break out the Cuttlebug. These are all cute cards and I know how much happiness they're going to bring to little faces! Love the vintage-look cards. My Mind's Eye is probably my favorite paper. Super cute cards! I love the reindeer. You have been BUSY! 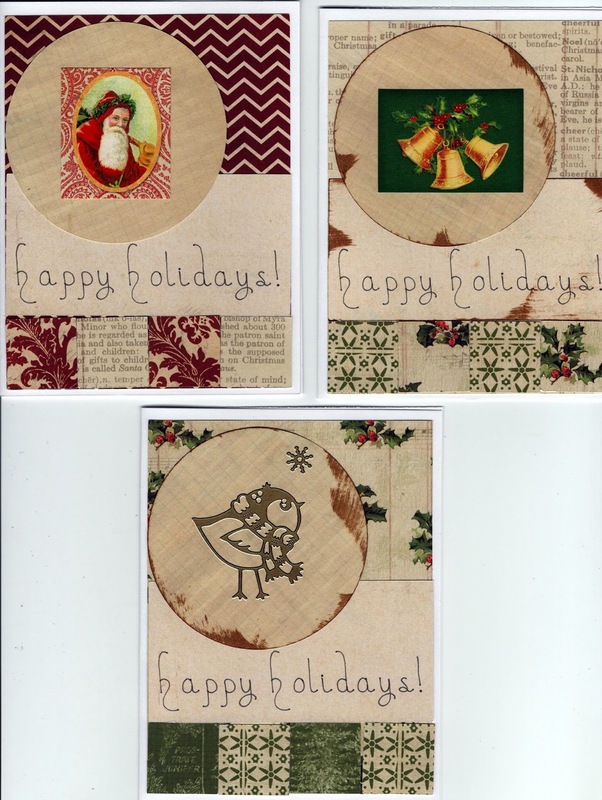 This is such a festive collection of cards...all of them are fantastic! Hard to pick a favorite set - loved them all and they were so festive. The little bird in the first set was a sure favorite - almost looked like an actual wood block - very cool. Fabulous. That's the way to make a bunch of cards in record time. Thanks for sharing. I love vintage Christmas and your cards bring out the essence of days gone by. The Recollections set is just so colorful and pretty! Incorporating the die cut with your Cricut is a great idea and you have given me inspiration to do the same! I love your second set of cards: how the are all made following the same sketch, yet they look so amazingly unique! Wow Cathy, Love your beautiful Christmas beauties. Have you "blog hopped" yet?? ?